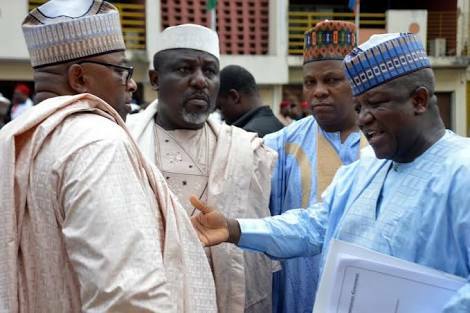 Nigerian governors have said they cannot afford to pay workers a minimum wage of N30,000 unless the organised labour wants its members to be sacked. Apart from this, the governors at their emergency meeting in Abuja on Wednesday night, asked the Federal Government to also accede to the review of the national revenue allocation formula, to give states more money. The Chairman of the Nigeria Governors’ Forum who is also the Governor of Zamfara State, Alhaji Abdulaziz Yari, who read the communiqué after the meeting, said that a new committee would be raised to meet with President Muhammadu Buhari over the issue. He said the committee would work out another formula towards quickly resolving the problem associated with the proposed minimum wage. Yari said, “Following a meeting of the Nigeria Governors’ Forum where we deliberated on the national minimum wage, governors resolved to re-strategise and put together another committee to meet with the President once again, to work out another formula towards quickly resolving the problem associated with the proposed N30.000 minimum wage which is impracticable unless labour agrees to a downsizing of the workforce all over the country or the Federal Government itself accedes to the review of the national revenue allocation formula. The federation account is currently being managed on a legal framework that allows funds to be shared under three major components – statutory allocation, Value Added Tax distribution; and allocation made under the derivation principle. Under statutory allocation, the Federal Government gets 52.68 percent of the revenue shared; states, 26.72 percent; and local governments, 20.60 percent. The framework also provides that Value Added Tax revenue be shared thus; FG, 15 percent; states, 50 percent; and LGs, 35 percent. Similarly, extra allocation is given to the oil producing states based on the 13 percent derivation principle. Yari said that he and his colleagues had seen the report of the Tripartite Committee report presented to President Muhammadu Buhari. The committee, which is headed by Amal Pepple, recommended N30,000 as minimum wage. Though the President received the report, he however said that he was still studying it. Yari said that the committee did not consider the submission of the governors who had earlier said they could only afford to pay N22,500 as minimum wage. He said, “We have seen what has been presented to the President by the (Tripartite) Committee. “As a member of the committee, our representative there said the committee did not take our submission of N22,500 because it came late. “I am surprised. How can you do this without the input of the states because the states are the key stakeholders in this business. He regretted that while the governors would want to pay, they would not be able to do so due to meagre resources available to them. He said “But we still say we want to pay, but the issue is the ability to pay. “If we say no, it is not about the ability to pay, just pay, I don’t know how this formulae will work and I don’t know how we can get a solution to the issue. “We are paying N18,000 (as minimum wage today), but when the President assumed office, about 27 states were not able to pay, not that they chose not to pay. “So, now you say N30,000, how many of them can pay? We will be bankrupt (if we pay). So as Nigerians, we should look at the issues seriously. “While other people are saying that governors are riding jets and living in affluence, that one is not luxury but compulsory. “Like Lagos that is paying about N7bn as salaries; if you say it should pay N30,000, now it will be N13bn. He said governors would continue to dialogue with workers on the need for them (the workers) to see the difficulties they (governors) were facing. He said, “As for the way forward, we will continue to talk with Labour. Let them see reasons and difficulties some of us have. “For instance, the money Lagos State is using to pay is not coming from Abuja. “They have a way of getting their money from the IGR and that is why they can afford to pay. They get money through VAT (as well). “Apart from Lagos, even Rivers State cannot afford to pay. So we have been crying out about this since 2011 but no one will listen. “One critical example is that some states ration their salaries while some others put everything they earn on the table and ask labour to come and see and ask them to suggest how much should go for capital and personnel costs. He said it was wrong to use the price of crude oil in the international market to determine the minimum wage. Yari said, “So, let us look at this matter seriously to see how we can do it properly. It is our primary responsibility to see that everybody is happy.